Demand for surfactants in Europe has been slowing for a number of years, and the majority of growth is focused in emerging regions such as Southeast Asia and Africa. Manufacturers are consolidating, investing elsewhere, or creating higher value, specialised products. Europe’s competition from China and India remains high. Worries such as Brexit and expensive or unreliable feestocks means that companies across the value chain are diversifying and looking for alternative ways to cut costs and improve margins through efficient processes and innovation. M&A from both ends of the chain safeguard big players against volatility. A wave of trends, including ‘free from’, ‘natural’, ‘organic’ or ‘sustainably sourced’ leave consumers confused about the sustainability of oleochemical versus petrochemical products. Alignment on labelling, definitions and terminology is a growing necessity for the industry. With the added effects of regulation, oil and shale prices, the circular economy and global uncertainty, there is much to be discussed in 2018. NEW FOR 2018 - Due to popular demand and great success at the World Surfactants Conference, the Innovation Seminar has been brought to Europe. Stay for the afternoon on Thursday to hear the latest trends and innovations in surfactants. 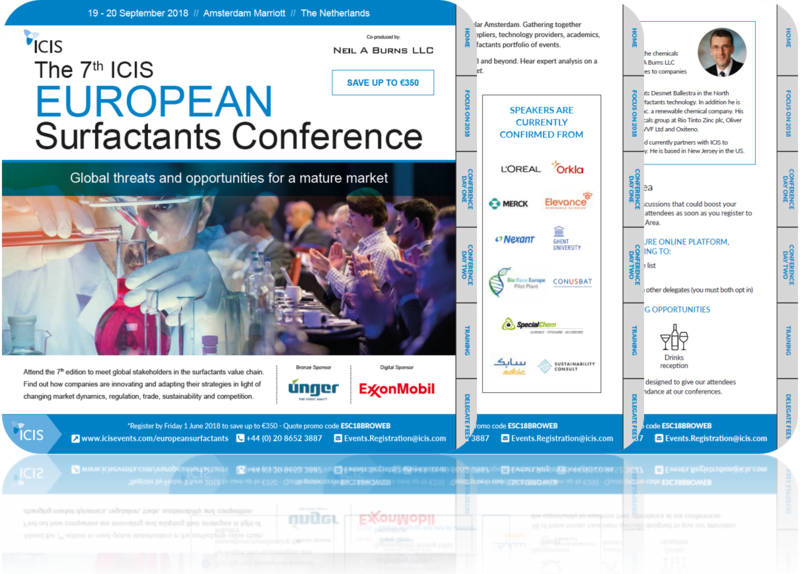 The European Surfactants Conference and Seminar provide the perfect platform to showcase your company’s products and services to a wide variety of industry stakeholders. Take this opportunity to raise brand awareness and foster existing relationships whilst developing new commercial connections through bespoke promotional packages. Surfactants Business Essentials is a one-day training course offering a non-technical view of the surfactants industry. The course will provide you with a sound understanding of value chains, costs and prices and where the opportunities and challenges lie, to help you make smart decisions in this sector. Maximise your time away from the office by attending the course just a day before the main Conference. Copyright © 2017 Reed Business Information Limited.